Buckwyld Media, through its association with The 2Face Foundation, brings the critically-praised “Eargasm” to Abuja for the second time through its special IDP charity edition scheduled for July 22 at The Congress Hall, Transcorp Hilton, Abuja, promises to deliver an evening of mind-blowing entertainment and pleasant surprises. interestingly, Eargasm Special IDP Charity Edition is the first of many fundraising events lined up by The 2Face Foundation and UNHCR as part of its commitment to raising funds to support the IDP intervention programs. Proceeds from the event will go to assisting fellow Nigerians living in IDP camps across the country. Like previous Eargasm editions, fans of diverse music tastes, genres and generations will be treated to a unique and unforgettable experience through the rendition of classic tunes with fresh twists. The fact that this edition is designed to raise IDP intervention funds and awareness makes it significantly more worthy of attending. The 2Face Foundation is a non-governmental organization focused on peace building in Nigeria through projects like ‘A Million Voices for Peace’, ‘The 2Face Peace Awards’, ‘Vote Not Fight’ and now this IDP support initiative with the UNHCR. 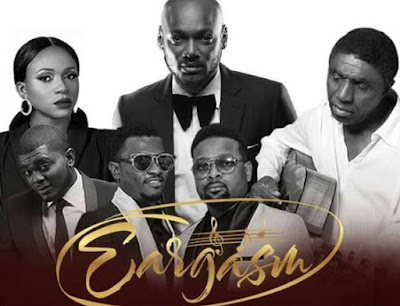 Eargasm: Special IDP Charity Edition is a Buckwyld Media Network production for The 2FACE FOUNDATION & U.N.H.C.R in association with Boomerang Africa & Yankee Entertainment.